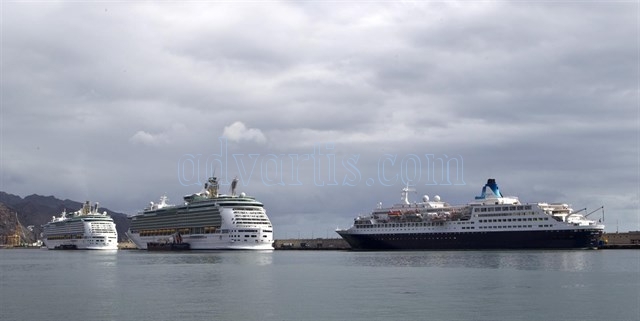 The port of Santa Cruz de Tenerife will again register this full weekend of cruises in its facilities by hosting six vessels of this category, distributed between Friday and Sunday, with an associated movement of seventeen thousand visitors, more than thirteen thousand they cruise. It will be tomorrow Friday when our installation lives the biggest movement to share with Ventura, TUI Discovery 2 and Mein Schiff 4, three impressive ships that will bring to Tenerife 8,700 cruisers, Germans in their vast majority, and 2,800 crew. The ships will coincide in port from nine in the morning to seven in the afternoon, time of departure of the Mein Schiff4, that will return to the facility Tenerife on Friday 27. On Saturday will arrive with operational port AIDAsol, which will dock in the alignment of Muelle de Ribera corresponding to the cruise station where the operation will take place. More than a thousand cruisers will finish crossing in our port, initiating so many others. Again there will be cruises on Sunday, in this case Black Watch and Balmoral, which will result in the arrival in Santa Cruz of two thousand cruisers and almost a thousand crew. Both units will dock early Sunday and remain in port until after eight in the afternoon.